Thank you for registering. 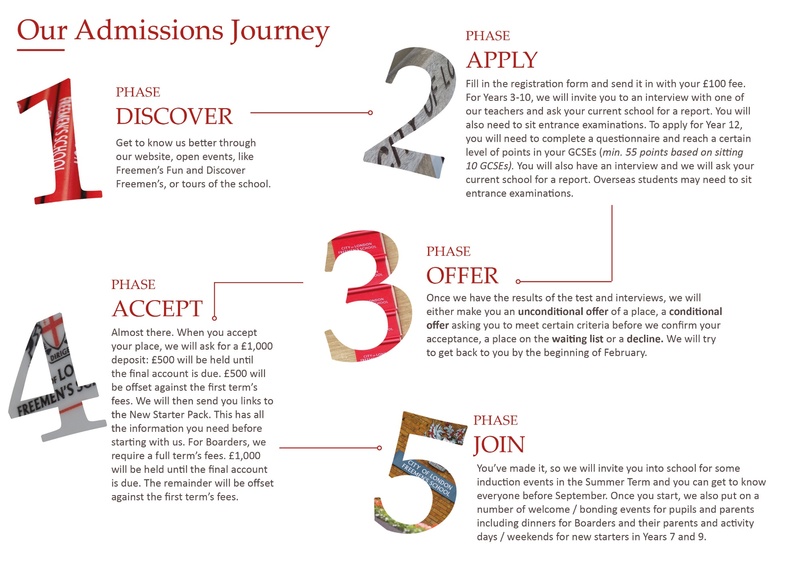 You have moved onto Phase 2 and 3 of the Admissions Journey. Thank you for registering. We will be in touch if we have not already been with a date for the assessments. We will request a school report from your child’s current school. This school reference and report are an integral part of our assessment for each candidate as they help us get to know them a little better and to build the wider picture of their academic and non-academic abilities and interests. We may also contact your child's current Head for more information. In accordance with HMC Guidelines, Freemen’s will not be able to reach a decision on your child's application for entry until we have received this report. 5 -17 November Online assessments in English, Mathematics, General Knowledge and Non-Verbal Reasoning. We will contact you with a date and time once you have registered. Interviews and Activities. Once we have reviewed the exam results, we will invite you in for a two hour slot. There will be two 30-minute interviews: one individual and one group. There will also be a carousel of activities to enjoy. Those students that require additional time will have that factored into their results. If your child is entitled to extra time, or special considerations, or has any Special Educational Needs, please inform us as soon as possible and supply any supporting information. Coaching for these tests is not encouraged. Interviews will take place on Saturday 12th January 2019 and will be by invitation only. There will be two interviews to find out more about your child. One will be a group interview, where they will be asked to do a task. And the second will be an individual interview to find out a little more about your child, what they enjoy at school, their hobbies and interests and also some questions to see how they think about things. Interviews for candidates residing overseas can be conducted via Facetime or Skype. In the Autumn term, we will request a school report from your child's current school. This school reference and report are an integral part of our assessment for each candidate as they help us get to know your child a little better and to build the wider picture of their academic and non-academic abilities and interests. We may also contact your child’s current Head for more information. In accordance with HMC Guidelines, Freemen’s will not be able to reach a decision on an application for entry until we have received this report. Please also be aware that for children attending maintained schools, parents may be charged a fee for this report by their child’s school. If applicants can sit the papers at Freemen’s, we will invite them to join us for the regular entrance exams in November. Otherwise, we can either arrange for candidates to sit entrance exams at their current school, at their agents’ office, if appropriate, or at a local British Council Office. If the exams are being taken overseas they will need to take place between 5th – 17th November 2018. Interviews can be arranged via Skype or FaceTime. Please make it clear on the Exam Confirmation Form or Registration Form that you intend to sit overseas. Number: Operations (multiply, divide, add and subtract), Fractions (simplify, add, subtract, multiply), Decimals (add, subtract, multiply, rounding), Negatives (add, subtract, divide, multiply), Percentages. Shape: Perimeter, Area (triangles, rectangles), Angles (triangles). Questions will be on subjects that an interested, outward-looking student of this age from anywhere in the world could be expected to know about and answer confidently. Subjects covered in this section are History, Geography, Science, Current Affairs and Sport. The questions will cover topics from around the world and will not be based purely on the United Kingdom. There will also be a short written English Exercise. We do not have sample papers for Non-Verbal Reasoning. These can be found at most retailers. We are changing the way we do entrance assessments for Year 7 and above. We will shortly be contacting anyone who has registered or enquired for a place and we will be telling local feeder schools. The entrance procedure is comprised of three main elements: tests, interviews and confidential report from the Head Teacher of the current school. Number: Decimals (add, subtract, multiply and divide), Fractions (add, subtract, multiply and divide (including mixed numbers), Lowest common multiples, Highest common factors, Prime factors, Percentages, Converting between fractions and decimals, Standard form. Algebra: Collecting like terms, Expanding algebraic brackets, Factorising, Substitution of variables, Solving linear equations, Linear graphs (gradient, y-intercept and line equations). There will also be a written English exercise. Decision letters will usually be sent by post the first week of February. In 2019, decision letters will be sent by 2nd February 2019. We regret, given the large number of applicants, that we are unable to give feedback on examination results. Once we have sent your offer, you will have until the first week of March to make your decision. When you accept your place, we will ask for a £1,000 deposit from day pupils or a term's fees for boarders: £500 (day) and £1000 (Boarders) will be held until the final account is due. The remaining will be offset against the first term’s fees. We will then send you links to the New Starter Pack, usually in May or June.This has all the information you need before starting with us. In June, we will invite all new starters for a taster day, so that they can meet the rest of their class and their teacher. That evening, we also invite all new parents in for a welcome evening and a chance to meet the Head of Year, the class teachers, current parents and the new parents joining that year. Then you will be ready to start in September. Over the summer, parents usually set up activities and bonding events for you to meet and our parents' association: the Freemen's School Association (FSA) hold a welcome coffee morning on the first day of school once you have dropped your child off. Bursary awards can be applied for once a pupil has received an offer of a place from the Headmaster. The application process will include a detailed financial assessment. Any award is subject to the pupil meeting the entry requirements of the School and an annual financial re-assessment. For any initial Bursary enquiries please email our Outreach Officer, Mrs Kerri Martin at kerri.martin@freemens.org . Music and Academic Scholarships are available for candidates entering Year 9 in September 2019. There is no separate application process for Academic Scholarships; ALL candidates for Year 9 entry will be considered on the basis of the entrance examinations and school reports. Those candidates scoring the top marks will be invited back to sit a critical thinking paper on Saturday 12th January 2019.
answer questions on their pieces, musical experiences and aspirations. Candidates are recommended to bring an accompanist with whom they have played before. If this is not possible we can supply an accompanist who will be available for 5-10 minutes before the audition time. If you are likely to require an accompanist, please email our Music Administrator, Mrs Grover, via sgrover@freemens.org once you have submitted your application in the Autumn term. You will also need to forward to her a copy of your child’s music. Candidates for Music Scholarships can contact the Director of Music via pdodds@freemens.org or on 01372 822449 for further information on the Music Awards. Finally, if you would not like to confirm entry for the entrance examinations in November, please complete the following form to indicate whether you wish the candidate to be considered for entry in the future.